We are delighted to welcome you to the American Tourister website (hereinafter referred to as the “Site”), the official online store for the brand American Tourister. We ask you to take the time to read these terms and conditions carefully. Unless stated otherwise herein, the relationship between American Tourister and its Users is exclusively governed by these Terms and Conditions that are deemed read and accepted by the User. If you do not agree to these terms and conditions in their entirety, please do not use the Site. American Tourister may from time to time amend the Terms and Conditions by posting such change at the Site. Use by you after such change has been posted shall constitute acceptance of such changed terms. Samsonite Southern Africa Pty Ltd is the seller of the products displayed on the Site. Samsonite Southern Africa Pty Ltd has its registered office at Block A Surrey Park, 6 Barham Road, Westville,3630. American Tourister uses its best efforts to keep the information on the Site updated. However, it is not possible to guarantee the complete absence of errors on the Site. The information and other material published on this Site may include inaccuracies or typographical errors. The weights, dimensions and volumes of the products are approximate only. We have made reasonable efforts to ensure that product information is accurate and to display as accurately as possible the colors of our products. or that the Site or the server that makes it available is free of viruses or other harmful components. American Tourister shall not be liable for the use of the Site, including, without limitation, the content and any errors contained therein. Cabin carry-on/hand luggage restrictions: while we make efforts to ensure that items listed as cabin carry-on/hand luggage meet current airline restrictions, we cannot be held responsible if an airline applies other check-in standards or if airlines or airports change their restrictions. The price of the products you order is the price that is displayed on the Site at the time you confirm your order and will be confirmed on the e-mail confirmation confirming receipt of your order. All prices are in South African Rands, inclusive of VAT and forwarding charges. After submitting your order we will send you an e-mail confirming receipt of your order. At that time we reserve the corresponding amount on your credit card, and we debit your card when we ship the goods. If you pay by credit card, you will receive an e-mail containing your payment status. As soon as the goods are shipped, you will receive a notification (the “Shipping Notification E-mail”). All orders are subject to availability of the products at the time of dispatch. We reserve the right to cancel your order for any reason. 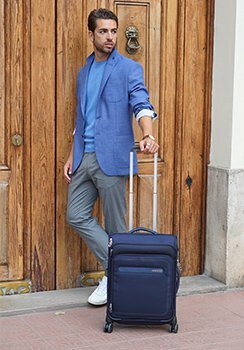 American Tourister retains title in the sold goods until we have received full payment of the price and shipping charges, and possible late payment interests and/or indemnities. While American Tourister is the seller, you must make payment to the bank account of Samsonite Southern Africa Pty Ltd, details displayed on the payment pages of the Site. The RPP is the standardized pricing that American Tourister charges for products. The RPP found on the eCommerce site is only valid for the www.americantourister.co.za site and should not be mistaken with in store retail prices or any other vendor selling the same products. The RPP of any products seen on the site may be changed at any time by American Tourister without notice. In the event of a sale on a specific product; the RPP will be visible on the product page along with the discounted price. In this event the discounted price will be the purchase price for the product. Any Coupon codes and or discounts provided by the site to customers will be applicable to all products that are not already discounted by the site. No discounts will be applied to sale items, discount items or promotional items. American Tourister reserves the right to revoke any discount, promotion, sale or coupon code at their discretion. The purchase price of any product will not be binding until payment has been made in full. Items placed into the shopping cart will not be considered sold until payment has been made in full and received by americantourister.co.za. Items placed into the checkout cart will be liable to the same T&C’s as any and all products that are on the site. Therefore product stock, price and any purchase related information may be subject to change before final payment has been made. Through our Site (www.americantourister.co.za) the products are delivered in South Africa. We will use all reasonable efforts to deliver the products ordered within the timescales indicated on the individual order confirmation to the User. provided that such person is present at the indicated address and an adult of 18 years or over. If there is no one present at the time of delivery, you will be asked to contact our courier service to arrange an alternative delivery date. Please follow the procedure below if you are to return any products under clause 9 above or as a result of incorrect products being delivered or in any other circumstances that Samsonite agrees with you for a return to be made. We will organize the pick up by our courier as soon as possible and in any event within 14 calendar days from the date you notified us of your return request. In the event that you have not respected all of the return requirements, we will advise you by email to clarify why we have not been able to approve it within 14 days. Only goods purchased online on the Site can be returned. As for any other return, we advise you to contact the store where you have purchased the goods. To exercise the right of retraction/cancellation, you must inform us of your decision to cancel this contract by a clear statement (e.g. a letter sent by post or email). We will collect the goods in the manner described, and bear the costs related thereto. You are only liable for any diminished value of the products resulting from the handling other than what is necessary to establish the nature, characteristic and functioning of the goods. You should not yourself send back the goods in a manner other than set forth, if you may do so anyhow, you are doing so at your own cost and responsibility. Consumers are entitled to the legal warranty. It covers lack of conformity of the goods at the time of the delivery. The seller undertakes to replace or repair the concerned goods (or parts) free of charge. The seller reserves the right to exchange the article if the costs for a repair are disproportionate, or if a repair is impossible. The consumer has the burden of proof to show that defects that appear after a period of 6 months following delivery were in place at the time of delivery. All brand names, product names and titles used on the Site are trademarks or trade names of American Tourister or third party trademark or trade name holders. You are not allowed to use or reproduce any such trademarks or trade names as they may constitute an infringement of the holders’ rights. All Site design, texts, documents, movies and other services and the selection and arrangement thereof, and all other material on this Site are protected by copyright of American Tourister or its suppliers. You are only allowed to electronically copy and print portions of the Site to the extent this is necessary for the purpose of placing an order, or for using the Site as a shopping resource. You are not allowed to make any other use of the information and materials on the Site, including reproduction for the purposes other than those noted above, modification, distribution, or (re)publication. Should you wish to use materials and information from this Site, you need to obtain American Tourister’s prior written consent. (c) No obligation is assumed by American Tourister or may be implied by the receipt or examination of the submission unless or until a formal written agreement signed by American Tourister and by you, and then American Tourister’s obligations shall be only as expressed in that written agreement. American Tourister: Samsonite Southern Africa Pty Ltd has its registered office at at Block A Surrey Park,6 Barham Road, Westville,3630. 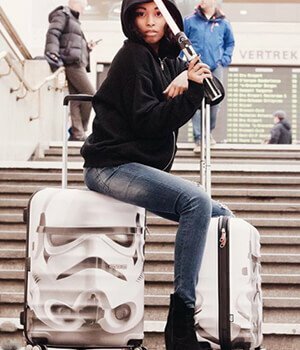 With respect to intellectual property rights “American Tourister” means Samsonite IP Holdings Sàrl, with registered office at 13-15 Avenue de la Liberté, L-1931 Luxembourg and with Company number B147735. Site: a collection of web pages grouped together under the address of www.americantourister.co.za. Any dispute regarding the validity, the interpretation and/or the execution of the Terms and Conditions is solely governed by the laws of South Africa and the South African courts. This clause does not affect your statutory rights. The User agrees that in the event of a dispute with respect to the use of the Site, electronic evidence (e.g. e-mails, back-ups, etc.) can be used as valid evidence. These Terms and Conditions supersede all prior terms applied with the User. For any questions, remarks or technical issues with respect to this Site, please contact us. These terms and conditions were last updated on August 14, 2018.